A social night for adult AGB players, managers, admins and members has been organised for Saturday the 15th of November in Shelbourne Park. Depending on numbers, a bus will be provided from Arklow, free of charge, and finger food will also be provided after the races. Tickets are just €20. Please contact Ray Menton, 085 1642221, or Mick Healy, 087 2363603, asap, to book your place. Race Night Info from Wicklow County Board at www.arklowgaa.com. Ladies AGM is on Friday the 21st of November in the Harbour Bar (upstairs) at 8.30pm. Club AGM is on Friday the 5th of December in Gaelcholáiste na Mara at 8pm. The AGB Table Quiz was a great success. The competition was fierce, the questions were unique and the raffle prizes were numerous. Thanks to all who helped to organise this highly entertaining night. The monies raised will support Cian McBride’s Shave or Dye campaign in aid of St. John’s Cancer Ward & The Cardiac Unit – Our Lady’s Children’s Hospital. 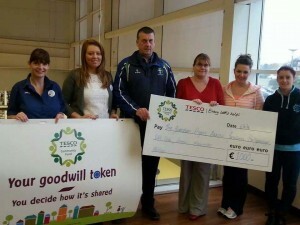 AGB were recently presented with a share of the Tesco Arklow Community Fund. The €1000 fund will be divided between AGB, The Guardian Project and Arklow Majorettes. Three very worthy funds. 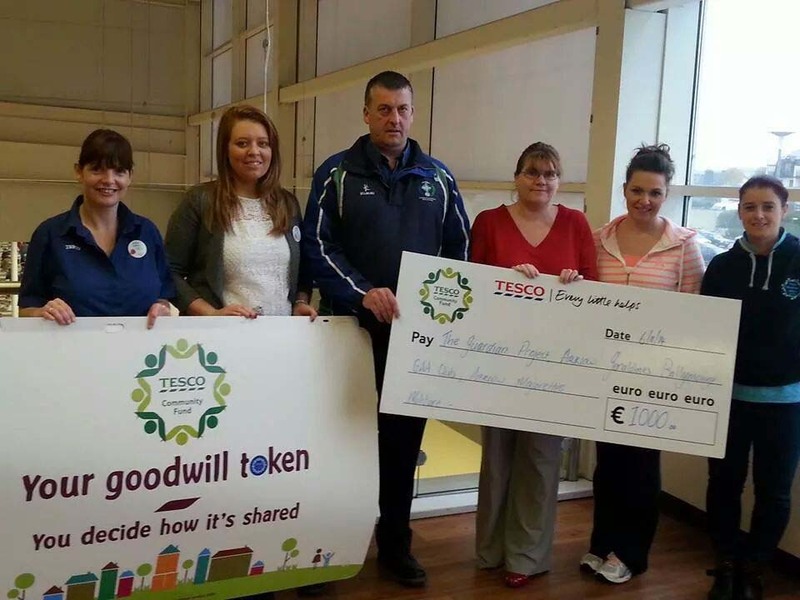 Thanks to Tesco Arklow for this support of local clubs and organisations. The U8 – U14 Girls Mini All-Ireland Tournament had to be rescheduled. Details will be posted when available. 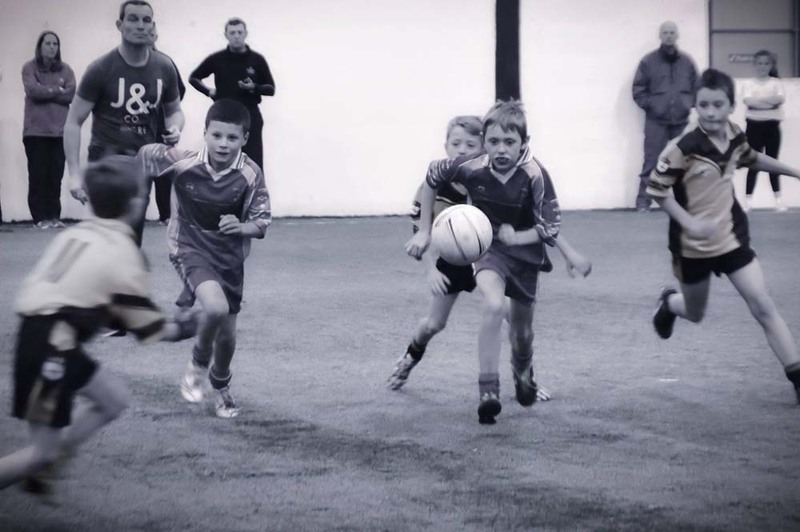 The U10 boys completed the last night of the indoor tournament in Castletown on Saturday the 8th of November. They played well in both games against Kilrush and Craanford. Thanks to Castletown for hosting a great tournament. The boys enjoyed the medal presentation and food afterwards in the clubhouse. Well done to all involved with this squad this year, coaches, mentors and parents. Very proud of their effort, progression and commitment of this very talented group of boys. Enjoy the break and back in action next spring. Best of Luck to the boys in their U14 B Shield Final. Details will be posted when available. AGB U16 Boys have still to play their Championship Final. Details will be posted when available. The AGB Ladies Admins/Coaches night out was held on Saturday, the 8th of November, in the Harbour Bar. The Ladies Presentation was also held as part of this social evening. Player of the year for U16 Ladies went to Kayleigh Earls, Minor Player of the Year was Aoife O’Reilly, Junior Player of the Year was Ger Galvin and Senior Player of the Year was Aine Byrne. The Club Person of the Year went to the hard-working Mick Healy. 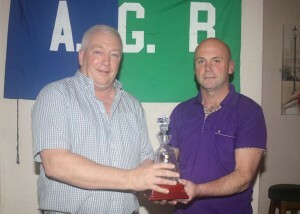 For full report and pictures see: Ladies Celebration Night at www.arklowgaa.com.